Have you ever had a decision to make that’s so big, so life-changing, that you weren’t even sure how to go about starting to make it? One that involved so many smaller steps that it was almost impossible to wrap your head around? That’s what’s happening to us right now. Our dream is to live in a shipping container, off-grid micro-home somewhere in the Pacific Northwest. I would blog full-time and do freelance copywriting work. My husband would pursue his dreams. And somehow, we’d have enough money to live simply and eat and be happy. We are so ready for this to happen we can almost taste it. Our reality? Our reality is that we live in Michigan. We’re contemplating putting our lovely little house up for sale in one of the worst real estate markets in the country. We’re contemplating selling or donating all of our possessions, quitting jobs, leaving our families behind, and moving across the country in order to pursue this dream. And yet we’re stuck. We can’t decide whether we should do this now or not. Should we call the realtor, or stay here another year until the market improves? Should I be trying to find more copywriting work, or use this time to start fixing up the house? Should we skip the compost pile I’ve been planning on because it won’t look good to potential buyers, or resolve to stay and do what we want? I wish I could go into all the factors that are involved with this decision; there’s so much more to it. But, let me just say this: I know I’m not the only one grappling with major decisions like this. Thousands, perhaps millions, of others are doing the same thing. Just today I found a lovely blog, Living the Rural Dream, written by a woman who is in almost the same boat as me. She’s a commercial copywriter who recently lost all her clients due to the economy (yes, Alice, I so feel your pain!). She and her husband are currently traveling across Europe with their young daughter, living out of a little trailer, and trying to find a place to call home. Right now she’s facing her own major decision that she’s stuck on too. And, there are countless others. People who have lost their jobs and are trying to decide if they should start their own business or go back to being an employee for someone else. People who are facing foreclosure and are trying to decide if they should move to a new place for a fresh start, or stay with what they know. How do you decide? How do you know if now is the right time to jump? How do you know if, in the face of so much craziness, it’s your time to place your bets and risk it all? I wish I knew. 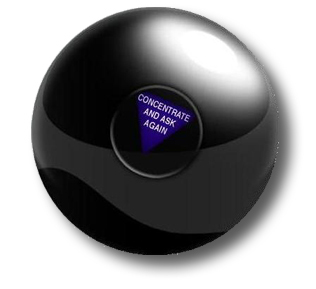 I’m almost at the point where consulting one of those “Magic 8-Ball” toys seems like a good idea. Anyway, I know this post is a bit rambling, and not about anything in particular. I really did sit here for hours trying to write something green and very informative. But all I kept coming back to was this decision we’re trying to make. We’ve been over and over it, and still can’t seem to come to resolution. So, I decided to just write about that instead. So, I’m putting this out there: if you’re grappling with a major decision and need to vent or work it out, leave a comment! I’ll read it as I sit here trying to decide what we we should do. Again. Always, for me, the question of health insurance rears its expensive head. I think only someone who has gone through a medical experience that, without insurance, would have bankrupted her and left her destitute forever, can appreciate how vital health insurance coverage is in this country. Also, I’d recommend finding out the cost of land on the Pacific coast, because it’s likely to be more expensive than you’ve imagined. Other than those two concerns, I’d say go for it. Life’s short. But do see if there’s any way to get health insurance. I’m self-employed, and already pay for my own health insurance. Luckily there’s Blue Cross here in Michigan, so it’s not that much. I haven’t yet researched to see if Blue Cross is out in Washington. I’ve already looked at land too. And all I can say is: OUCH. It’s definitely more expensive out there than it is here in Michigan. Still, we want to go for it! I’m often tempted to look more seriously at co-op living… but Texas is where I need to be for a while (ailing parents), so it’s not too realistic. All the best! I was born in Michigan; also lived in Texas, New York, Ohio, and then I drove 2650 miles with one little trailer, do move to Seattle in June of 1980. I sold everything but just what I needed; clothes, a few personal items……. I loved my 3 years in Seattle; however, it is much more expensive than living in Michigan. The winters are milder, but it rains about 60 to 70% of the time, so you have to drive up to the mountains to get away from the rain; then of course, you get snow. I’ve traveled all 48 states; spent 5 years living in an r.v. – toured the whole USA, and it was the best time of my life (and I was single; back then, I was 53; took just the bare essentials, and enjoyed getting off that ‘grid’. I remarried when I was 58, and my new husband wanted me to stay ‘fixed’. I also lived 20 years in Orange County, California – lovely, but expensive and much too much traffic. If you go outside of Seattle a bit; south to Tacoma, or up into the Everett, Washington area, you’ll find housing a bit less expensive. The islands are beautiful; very expensive, but charming and it’s great taking a ferry over to visit them. It’s less costly to live in Walla Walla; Enumclaw, and Yakima – lovely spots; not as close to the Puget Sound, but still lots of tall trees; great ferns and foliage, and terrific sea-food and fresh produce. I don’t know what it costs to live in Crescent City, CA, but it’s small – on the ocean, and very north, so this might be something you could look into. Also, parts of Oregon (I have a friend who lives much less expensively, and he lives in Jefferson City, Oregon). I’ve spent a lot of time in Oregon; just beautiful, but hard to find low-cost real estate. If you want an art community and a good group of writers, you can check out Salem, Oregon – it’s lovely. Coos Bay is nice….Portland is over-rated, and very expensive. It’s easy to Google the towns; then get real estate information. Seattle has had a considerable down-turn; the Post Intelligencer just closed, and funding for the ports and on-going needs of the city, are short. You can type in Seattle Times; the only newspaper of any size now, and get information from their real estate section. Hope this gives you some suggestions that might help. I should mention, we ultimately retired in Laughlin, Nevada – housing much less expensive, but certainly not as scenic as Seattle – still, we are surrounded by mountains, and it’s not far to the Grand Canyon (180 miles); 90 miles to Las Vegas if you want a ‘fun time’ (and prices are low right now), and lots of off-road secluded places between Nevada and the border town we live in (it borders Arizona and California). If you want to see more about where we live, you can visit http://whyilivewhereido.blogspot.com I’ve put a number of photos there, and given some particulars of why we chose to retire in Laughlin. Oh yes, and Ashland, Oregon is another favorite of mine. LOL. Here I am reading your post with interest because obviously I’m in a similar boat (or camper!) and then there I am! Mentioned on your blog! Thank you 🙂 It is truly nice to meet people who can totally understand where you’re coming from. Wow, Thanks to all of you for writing in! Diane, your life sounds lovely. It must have been wonderful to do all that traveling! Both of our hearts are set on the Puget Sound area, although we’re definitely going to give Oregon a good look; I’ve heard nothing but good things about that area as well. And thanks for the tips on the artsy towns; that’s definitely right up our alley! Alice, I do know what you mean. I’m about to turn 30, and am realizing quite suddenly that yes, the clock is ticking. I’ve always followed my heart and thus far, don’t have any regrets. But this is definitely the biggest leap we’ve ever made. We both want this, but it seems to come down to timing. I think we’re going to sit down this weekend and, over lots of wine, come up with THE PLAN. With an actual timeline. Thank you so much for chiming in with your thoughts. It means a lot to me! Yes, I saw that movie years ago and was really struck by it. I thought it an apt title for this post! I think there is Blue Cross in Washington. 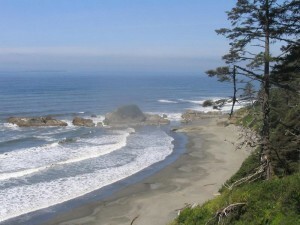 Certainly, in my mind, there are few places lovelier than the Pacific Coast. I grew up there and miss it tremendously. I keep reading a lot about micro homes these days, but the main problem with this solution to high housing costs is that many communities won’t let a person erect a tiny home on their land, the municipalities have imposed restrictions on how small a house can be. The Tiny House Blog and the Tiny House Design blog are interesting to read through. Excellent! More power to you, literally! :o) The mrs. and I when we were first married lived up in the Pacific Northwest! We loved it there! Not sure about off the grid….I like my ‘modern day amenities. Yes, I am officially a suburban grid junkie…what happened??? Really like this blog, thank you for sharing it!! Off-grid means we’d be completely self-sustainable. We’d produce our own energy (from wind) and not have to depend on “the grid” for any of our needs. We’d have composting toilets (so no sewer line) and our own well for water. You can totally have a modern day life with heat, electricity, and hot showers and do it all yourself. I love that idea! Oh man, that is a dilemma! Even if you have to put if off for a bit, try to make the “postponement” a set amount of time so that life doesn’t get away from you! I look forward to hearing about y’alls adventures either way… thanks for letting us all in on it and having a great blog! I feel your pain. We are in a similar situation. We want to move to Ecuador, but need to sell our 40 acres here in KS to be able to afford the move and get some acres there, and live self suficiently and sustainably. But in the mean time we are living in a tiny trailer with no room and 3 young children, so we are in a quandary as to doing anything with our land or not. We really want to, but if we sell it will it be a waste of time and money? I don’t know. I am leaning towards doing improvements on it that will increase its value for resale. I would advise you to sell your house for what you can now, don’t wait. Get to the Pacific NW and set up there. I really doubt the housing market is going to improve at this point. Go seize your dream, carpe diem!